Combine the features of two sprayers into one with this convenient Noble Chemical 10" foaming spray trigger! Designed to fit most standard size spray bottles, it can be used with foaming solutions or regular solutions. It'll help you tackle your daily sanitation needs, and the leak-proof design saves on cleaning costs. We can never have enough spray bottles or spray nozzles. These work well. I don't think we have had one break or clog yet. They have fit all the bottles we have tried them on so far. This is a pretty nice trigger, it sprays most of the liquid from the bottom. Handling it is comfortable and it fits on nice and tight on the bottle. This is a nice sprayer. We like that this sprayer makes the cleaner come out as foam rather than just liquid. A decent amount comes out for each spritz. These spray triggers are the best, built in screen in the tip for making foam and letting the product last longer with out losing quality, the screen is hinged in case you don't want to use it. This Noble Chemical sprayer comes with a removable mesh screen that converts the standard spray into a sudsy foam when used with foaming liquids such as dish detergent. By diluting dish soap with water in the bottle, this foam sprayer helps prevent waste of detergent. These sprayers are an excellent choice to use for cleaning and light duty spraying. We use it for glass cleaner and spraying water onto our plants. Paired this up with the Noble Chemical Food Surface Sanitizer bottle and it worked perfectly. Easy to use, didn’t break like some spray nozzles do. Noble chemical spray trigger is 4 stars! Comes in classic white! And, it’s made strong and sturdy! Great price too. You should give it a try! The triggers have held up to acidic cleaners well which is more than most other sprayers. The one downside is the spray pattern isn't very even. This spray drigger is good quality plastic. It's fit perfect on mostly all spray bottles.And straw is long enough to touch on bottom of the bottles. This foaming spray trigger does a great job of spraying cleaning materials. The foaming action does help apply the cleaner evenly. The nozzle can be rotated to turn off the spray capability, or allow it to foam-these are the only two options. This 10" Foaming Spray Trigger is a good attachment to the already bottled cleaning solutions we purchase, the spray trigger head screws right into them when we use a new bottle and reaches the bottom to use as much liquid in the bottle. I buy these Noble Chemical 10 inch foaming spray trigger whenever i need. They work pretty good and will keep buying from Webstaurant as needed. Its a foam spray trigger, theres not a ton to say.. BUT it certainly does it's job & so far i have no complaints. The handle feels nice & works every time, it doesn't leak while using it with anything i have put it on... over all its a great spray trigger if you're looking for a foaming one! great price & i will continue to buy! The 10 inch foam spray trigger is perfect for all noble chemical bottles. it fits well and does not leak. The trigger pulls easy and gives you a great spray every time. I never thought to order a foaming spray trigger from Webstraurant but very glad I did and would definitely order again. This ten inch foaming spray trigger is perfectly described on the website. It feels durable but has just the right amount of spray options. It fits perfectly on any Noble bottle. Great construction and even better price!! These triggers were great because they fit a variety of the bottles we already had in house. Additionally, I always prefer having the option of a spray or foam on my trigger and these both work great from this product. I use this foaming spray trigger when cleaning my windows. The foam is far more efficient than a standard spray. Better at fighting gravity so I use less windex. This spray trigger is built very strong for the price while most spray triggers are cheap and do not last. These will be the last triggers you will ever need to purchase again! I would highly recommend. We purchased the spray trigger to replace a few of our old, outdated spray handles that have either broken down or quit spraying. These foaming spray triggers are nice as they spray a fine foam that isnt just all bubbles. At first I was going to buy the cheaper spray nozzles, but I gave these a try and was glad I did. I love them and replaced the heads of all of my spray bottles with them. Easy to pull foaming spray trigger that can be adjusted for either spray or stream setting. Well made with heavy plastic and squirts with efficiency. Noble is the name you can trust. This form spray trigger comes in handy for spraying any cleanup job. The price is good too. 4 stars. This is a good quality product. It will mist, spray or foam. It has a locking feature so it won't spill. The tube is a little long but you can cut it if you want. Noble Chemical 10" foaming Spray Trigger works great! Nice even spray! We used in combination with 32oz Noble Chemical Sani - 512 Food Service Sanitizer Bottle! Many times the spray parts of bottles stop working or the spring slips or it just stops picking up the liquid but this one is working great so far! Good to know you can just spray the cleaning solutions and easily wipe them off and that it will work for several uses. The Noble Chemical 10" Foaming Spray Trigger (IMP 7029) met my expectations. The quality is good and the price is reasonable. It fits the Noble spray bottle that I purchased. Great trigger here. The straw was a bit too long so i snipped some off the bottom and it still works good as new and foams very well! I purchase this Noble Chemical 10" Foaming Spray Trigger so I can use it on a Nobel bottle I have. Very good foaming power and easy to get cleaning. I will be buying more of these for my other bottles. this is a great spray trigger for the value, no other spray triggers compare to this spray trigger, if only all other spray triggers like this. 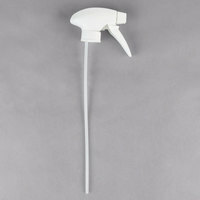 This spray trigger is perfect for dispensing glass cleaner, sanitizer or any other cleaning chemical. Works great with quart bottles or trim the hose and use in smaller containers. Nice spray bottle attachment, would use it any times over and seems like it will hold up, just need to cut to size of bottle, at least 1/4 inch. Nice spray trigger that's comfortable to use and really inexpensive. I bought a couple of these spray heads along with the Noble bottles (IMP 5032WG). Just had to trim a little off the end before inserting into bottle. I got this to fit the 32 oz. Labeled Bottle for Noble Chemical Sani-512 Food Surface Sanitizer (IMP 5032WG) I ordered and it fits perfectly. Seems strong and well made. I purchased the Noble Chemical 10" foaming spray trigger for my kitchen. The handle has a nice spring action that is easy on the hands. Super cheap and appears to be a decent quality spray trigger. It is almost slightly too long for the Noble labeled bottles, but it fits. Great little trigger for many uses and fits all the bottlers that we use. It is well built and the adjustable nozzle makes it versatile.